Vancouver folks are fortunate to have remarkable hiking easily accessible to them. Not only are the trails close by, there are dozens of them, each offering different views and terrain. North and West Vancouver have the serious trails, as the mountains are the backdrop for all of the trails if you’re heading in that direction. BC has about 40 species of native trees, and when you’re hiking, you’ll find trees such as Cedar, Fir, Hemlock, and Alder. The ground cover may include Salal, Huckleberry and Lupine. With the exception of Stinging Nettle, (which is not in many areas), the plants are benign. Thankfully, there is no Poison Oak or Poison Sumac. Capilano Park is a wonderful hiking spot because it has a canyon, a dam, a fish hatchery and it’s close to major arteries. You can enter at 2 points from Capilano Road, and do a loop, or just walk out to various places to enjoy the views of the river and mountains. You enter Lynn Canyon if you go up Lynn Valley Road and take a right onto Peters Road. There is a wonderful suspension bridge which you can cross for free. The trails are easy, and you can go up or down the trails that wend their way through the forest above the canyon. Lynn Headwaters is at the top of Lynn Valley Road, and offers more extensive and challenging hikes. 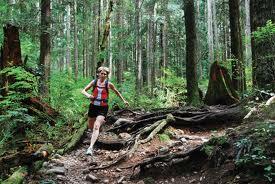 The Grouse Grind is a very popular trail that is like an endurance test for some as it is difficult. Imagine climbing stairs of various heights in an overall elevation gain of about 2800 feet in just under 2 miles! If you’re feeling especially fit, you can hike up to the top of Grouse Mountain and take the SkyRide down. The descent costs only $5.00. The trail, called the Grouse Grind starts on the east side of the road just at the beginning of the parking lot. It’s 2.9 km pretty much straight up. If you’re in good shape, you can make it in about an hour, give or take a few minutes. The Grind is very popular with locals who like to brag about their times. There’s a race to the top every year. This year’s winner did it in 27.5 minutes. The fastest woman did it in just a second over 34 minutes. Cypress Provincial Park has some magnificent hikes that vary from easy to difficult. You can snowshoe in the winter and hike in the summer. At Hollyburn Mountain, you can climb to the peak in about 3.5 hours, or you do an easy hike around First Lake, which is 15-20 minutes from the parking lot. Click HERE for more information about Cypress Provincial Park. The Baden Powell Trail is a 25 mile long trail extending from Horseshoe Bay In West Vancouver to Deep Cove in North Vancouver. It’s fun to do parts of it, but some enjoy doing the entire length in a race fittingly called the Knee Knacker. Some sections are very rugged and steep.